The Pond Course, which goes to the three crater ponds (Byakushi Pond, Rokkannonmiike Pond, and Fudo Pond) located clockwise from the trail starting point near the Ebino Eco Museum Center, is a two-hour trekking course to enjoy the different sceneries of each crater pond with steep slopes around Mount Shiratoriyama. There is a shallow crater of 600 meters in diameter at the top of Mount Shiratoriyama, and you can see Sakurajima Island to the south and get a close-up view of the Mount Karakunidake scenery. 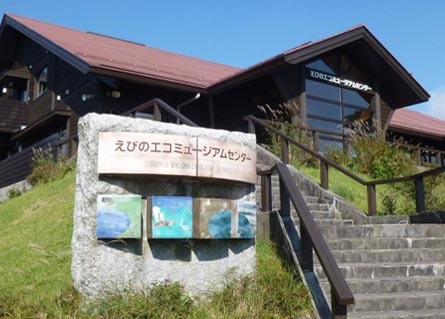 This museum introduces the nature of Kirishima with panels and images. 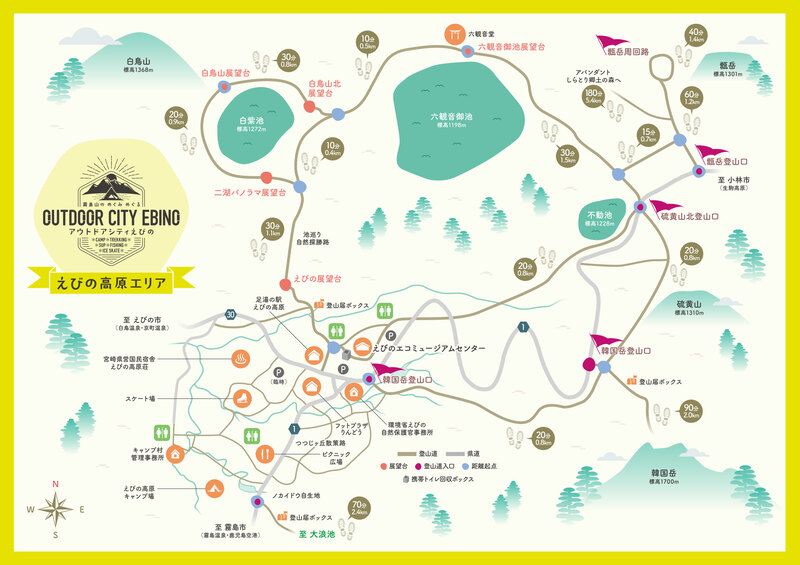 You can learn about seasonal nature, climbing, and volcano activities at Mount Shinmoedake. Fudo Pond is located along Prefectural Road No. 1 and is the smallest crater pond on the Pond Course. 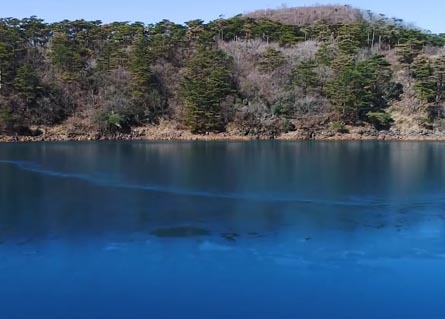 Fudo Pond can be a mysterious cobalt blue depending on the reflection of the light. 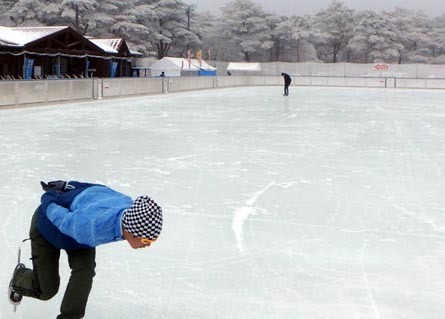 An outdoor ice skating rink at the most southern point of Japan, you can enjoy skating with a wonderful backdrop of Karakunidake. From the highlands, you can see a spectacular view of the Kirishima Mountain ranges, a sea of clouds, and the countryside. When the weather is good, you can also see Sakurajima Island on Kinko Bay. On December 24, 1966, Yatake Highlands Area became a Miyazaki prefectural natural park (Yatake Highland Prefectural Natural Park). Yatake Highlands Belton Auto Campground, a western style camping area, was opened in July 2001. 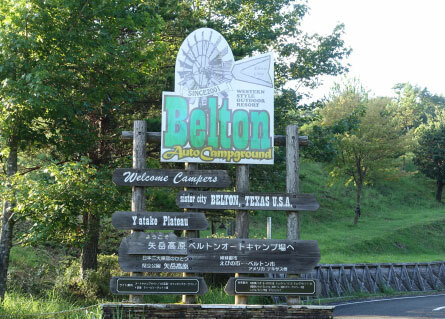 The camping area was named after one of Ebino’s sister cities, Belton, Texas, USA. The camping area has windmills and a unique atmosphere. 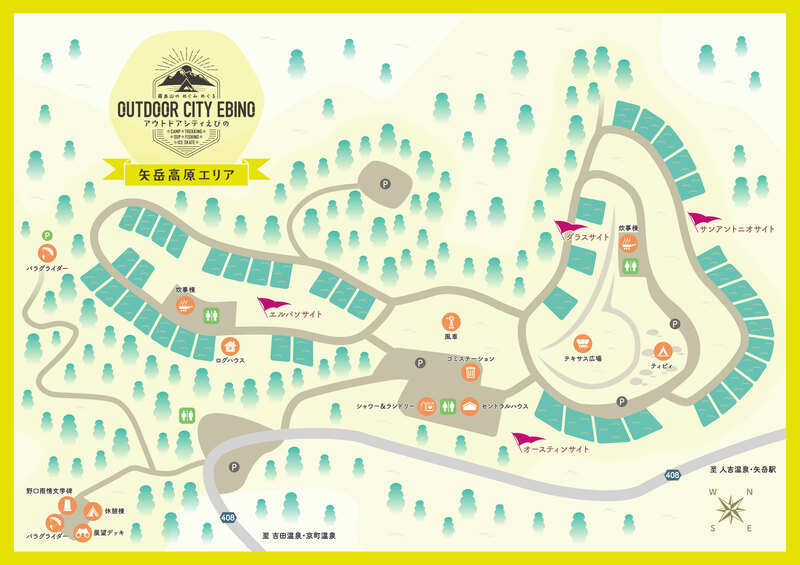 This is a western style auto camping area located on the large panorama of Yatake Highlands. You can stay the night or just spend a day there. 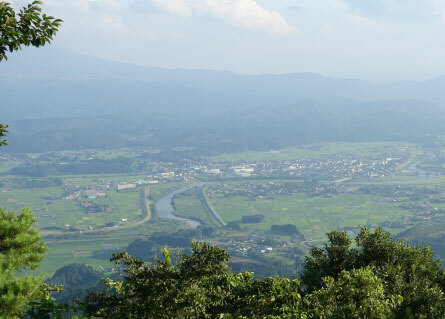 The scenery from the observatory is considered to be one of the three greatest train views in Japan. You can feel the majestic nature physically and spiritually. 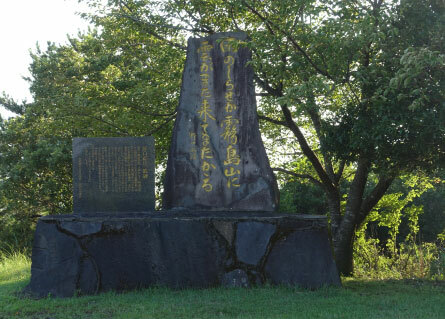 Ujo Noguchi, a Japanese poet and lyricist of children's songs, visited Yatake Highlands in 1935 and wrote the poem “it might rain, clouds are coming back to Mount Kirishima”. Kuruson is Buddha’s name before he became Buddha and is known as a holy place where mountain priests used to train. 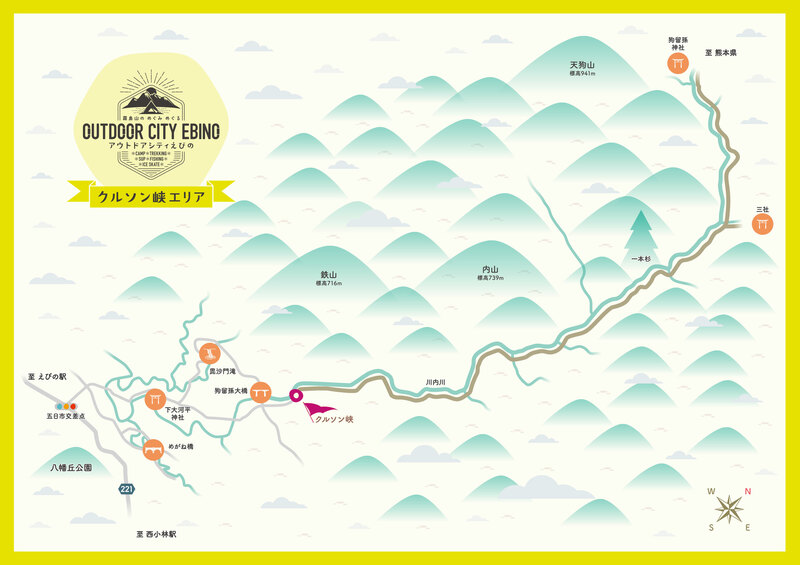 There is a gigantic Kuruson rock at the top of the Sendaigawa River in the 10 km gorge. The Hayama Temple ruins, the second oldest temple in Japan, are located deep in the gorge and were built by Saint Eisai who wished to transfer the spirit of Kumanosanshogongen to this place. The gorge has a breathtakingly beautiful view, especially in fall when the leaves change color. 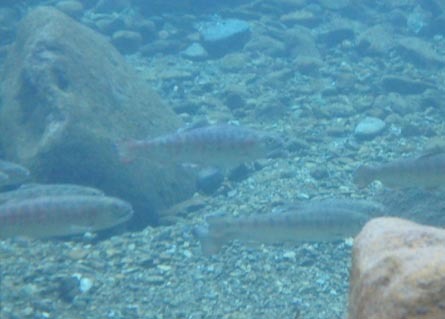 The valley is also well-known for being a good fishing spot. 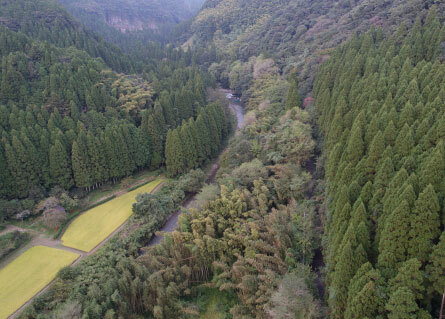 The stream originates from Mount Shiragadake in Kumamoto Prefecture, eroding the bedrock of the Shimanto layer, and the cliff is over 100 meters in height. There are mountain crags, huge boulders dot the landscape, and ignimbrites are spread about. *Note that the road is not paved so the undercarriage of vehicles may get scratched. This gorge is loved by fishermen and the road along the gorge is very popular with off-road motorcycle riders. 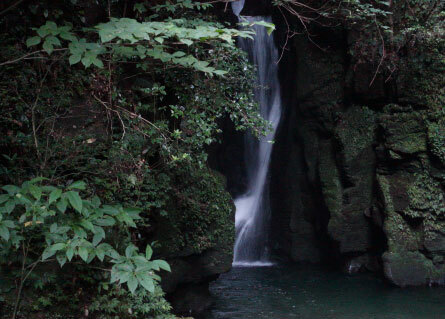 The waterfall was named after Bishamon Temple that existed in this area during the Enpo period (1673-1681). The deep blue water in the waterfall gradually changes color depending on the season. The water is very clear and deep blue in color, and is inhabited by yamame trout and giant salamanders.